This is a California Assessor Portal where you can access forms used statewide to assist Assessors in administering California property tax laws. To start, select the county where the property is located, then choose the form you need. 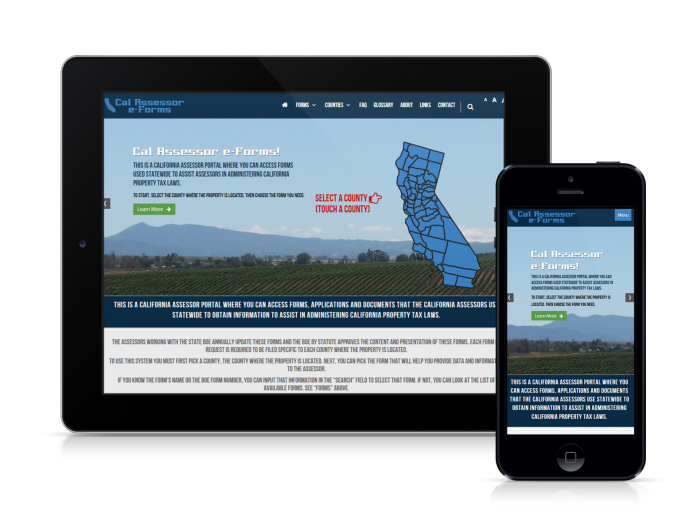 This is a California Assessor Portal where you can access assessor forms used statewide on various smart mobile devices. The Assessors working with the State Board of Equalization (BOE) annually update these forms and the BOE by Statute approves the content and presentation. This site does not collect or retain any individual data. 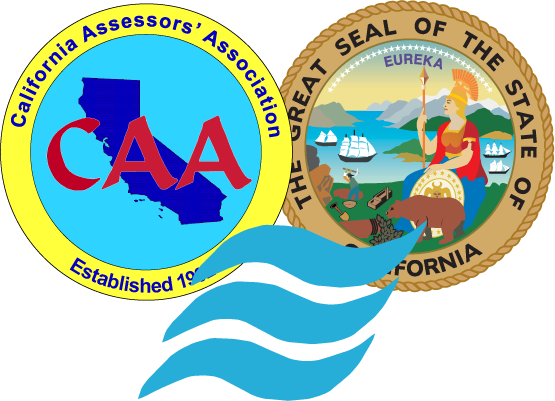 This is a California Assessor portal where you can access forms, applications and documents that the California Assessors use statewide to obtain information to assist in administering California property tax laws. The Assessors working with the State BOE annually update these forms and the BOE by Statute approves the content and presentation of these forms. Each form or request is required to be filed specific to each county where the property is located. To use this system you must first pick a county, the county where the property is located. Next, you can pick the form that will help you provide data and information to the Assessor. If you know the form’s name or the BOE form number, you can input that information in the “Search” field to select that form. If not, you can look at the list of available forms. See “Forms” above. You may qualify for a program that could save you money on your property taxes. View a list of programs and get the forms here. State law requires that a completed Preliminary Change of Ownership Report (PCOR) be filed when a deed is recorded. Failure to complete and return the COS within 45 days will result in a penalty. If you own and occupy your home as your principal place of residence, you may apply for a Homeowners’ Exemption. A Homeowners’ Exemption will reduce your taxable value by $7,000, and can save you at least $70 on property taxes every year. Property owners are responsible for notifying the Assessor if their mailing address has changed. Property valuation information and tax bills are mailed to the current address of record on file with the Assessor. A veteran who is rated 100% disabled due to a service-connected disability, or the unmarried surviving spouse of such veteran, may be eligible for an exemption of over $175,000 off the assessed value of their home. Parent(s) and child(ren) can transfer a principal residence, or up to $1 million of other real property without reassessment. To qualify, a completed application must be filed with the Assessor Department within three (3) years of the transfer, or before the property is sold to a third party, whichever comes first. Homeowners who are least 55 years of age may be able to transfer the taxable value of an existing residence to a replacement residence, if the market value of the replacement is less than or equal to the market value of the existing residence. Homeowners who are severely and permanently disabled may be able to transfer the taxable value of an existing residence to a replacement residence, if the market value of the replacement is less than or equal to the market value of the existing residence. New construction done to make a building more accessible for disabled persons may be eligible for an exclusion from property taxes. New solar energy systems may also be excluded to the initial purchaser of the property. Grandparent(s) can transfer a principal residence to their grandchild(ren), or up to $1 million of other real property without reassessment. To qualify, all the parents of that grandchild (who qualify as the children of the grandparents) must be deceased as of the date of transfer. Property that is damaged by a calamity such as a fire or earthquake may qualify for a temporary reduction in taxable value. Physical damage to the property must be at least $10,000, and a claim form must be filed within 12 months of the event. Property owned or operated by a non-profit organization and used exclusively as a church, college, cemetery, museum, school or library may be eligible for an exemption from property taxes.